So I was contemplating purchasing the K&N Apollo Intake System(09 Clubman non-S) and decided to call outmotoring to confirm some details. I was told that there might be a massive air sensor that will not allow the CAI to work with it(they weren't sure if it was the Clubman that had the sensor or whether it was another model). Either way, since outmotoring cannot give a definitive answer, I'm relying on the NAM gods to point me in the right direction. is the air sensor physically blocking the intake or is it something with the computer not liking free-er air flow. There is a MAF (Mass Air Flow Sensor) on the left side if the air box if you look under the hood. I looked at the K&N Kit and could not see an adadpter to keep the MAF in line with the CAI. I agree with OutMotoring, I don't think that CAI will work on a Clubman. 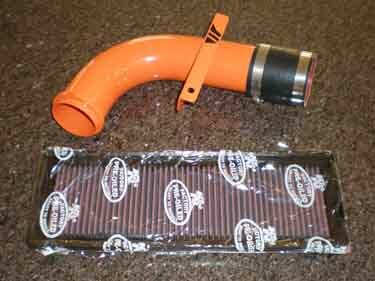 Perhaps a K&N drop in filter may be best for the Clubman? As i believe the clubman and the coop have the same intake you may want to check out this thread and a few others. Search it your friend. Edit: i just checked and both the clubman and the coop use the same intake box and parts to the engine so what every fits a coop should fit a clubman just fine. That's exactly what I was told. I was also informed that these were added after a certain date so not all(maybe all Clubman) are affected. I'm guessing the ECU will adapt to a perceived increased load because of the increase in air flow? (hence the problem with using the kit) Correct me if I'm wrong though. According to Mini Parts there is only one MAS, one Filter Box and one Plastic Intake Manifold for all 07/08/09 justacooper and 08/09 clubman. With this in mind the Intake Manfold and the Filter Box would be removed and the CAI would go in place of those items. The MAS would be between the CAI and the Engine Intake Manifold. So what ever works on a R56 will work on a R55. Now i may be wrong on this but This is how i see it. Done this on other cars. Just more parts to remove on the Mini. you can find the dimensions you want and order that filter and it should just clamp onto the MAF sensor side of the airbox. so all in all remove the airbox and just slap the airfilter on. the only thing that has held me back is that i dont know the exact size i would need for the flange inside diameter. i think it is either 68 or 70mm. my calipers arent that exact to get a 2mm difference. so if someone knows what size the flange is....it would be greatly appreciated. though i do think you can get up to a 5.5 in diameter base in the space. i was thinking of going with either RC-9350 or RC-9310 from the K&N link above. and as for the flow...the MAF should just tell the computer that there is increased airflow and adjust the fuel mixture. i wouldnt think it would throw a code. and oxybluecoop hasnt said if there was that problem. hope this helps. thats a lot simpler than i thought... as long as its after the MAF sensor you should be alright. only issue is that these filters are very oily and will drip. Yes--- oily filters will ruin the MAF sensor. Anyone interested in a Group Buy for CAI? I emailed VIP and they might be interested in the Group Buy from NAM Members - anyone have experience with this? BR55: I'm definitely in. Was just waiting for VIP custom to release this. At the same time though, I am curious as to see what DDM releases. :P Any info on what gains the VIP intake gives(if any?). Or at least a different sound? pleading for dyno guinea pigs before i take the plunge. anyone? Oxy: Could you post a DIY for the open cone? I cannot figure out the parts you used. All I know is you had a friend fabricate a one off tube for you- which makes the mod difficult for the rest of us. Any suggestions? First off I would disconnect your negative battery cable and press your brake so your ECU will be reset once you finish. Step 3: Where the plastic intake hose(14)connects to the muffler(12)wiggle that tab(second pic) on the left and pull the hose out. Step 3: Loosen the clamp on the left side of the MAF where it attaches to the rubber hose. Step 5: Hold the muffler(12)and pull up to unlock it from the airbox and off she goes. Step 6: The airbox has two rubber grommets(6) holding it to the engine so your gonna need to give it a good pull straight up and it'll come out. Step 7: The intake hose(14) is the most stubborn to remove. It has two lips that hold it to the frame. I just squeeze it real tight and wiggled it loose. Now that the entire assembly is removed it's time to disconnect the MAF sensor from the airbox. Very simple procedure just loosen the two torx bolts(an allen wrench works fine) and pull the MAF sensor out. When you go to attach your new cone filter take a look at the air flow direction arrow on the side of the MAF sensor. The filter attaches to the honeycombed end. I found everything I needed for all my setups at Pep Boys. The other stores just had the filters where Pep Boys has all different accessories and sizes. Last edited by Oxybluecoop; 08-05-2009 at 09:39 AM. Oxy: Why did you switch from the first 2 set ups to the 3rd one? I have the lowest IAT's aind highest air flow volume with my current setup. interesting. i'm a newbie to this induction stuff. not you for sure. thanks for the diy guide and pics. very informative. guess the oem air intake tubing is pretty weak and hot. i'm guessing vipmotor's new CAI coming out will have the similar restrictions albeit a less restrictive filter. how are you measuring the IAT and air flow? via obd2? The air temps are on my ScanGauge II and volume with a air flow meter. just saw a new picture of the intake option from VIPCustomParts. I already have the K&N drop-in filter. do y'all think the new intake tube will make a substantial additional difference?